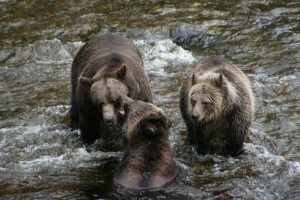 A great action photo of one grizzly asserting its fishing rights. Almost looks like a lecture but I think it has gone a little beyond a discussion. The disagreements on the Glendale River, which is Grizzly Bear Lodge’s viewing area, tend to be settled with a few roars and mock charges and then all is well and life continues. 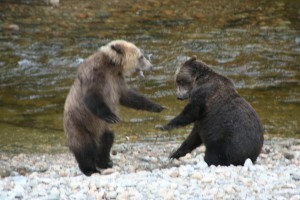 The compatibility of the bears is due to the common reason for being on the river; that is food in the form of salmon to provide the fat to survive the winter. In the end survival always wins. A well-fed family. This photo of a mother grizzly bear and two-year-old cubs was taken in October near the end of the salmon run in Knight Inlets’ Glendale River. These grizzly have had all season to put on their winter layer of fat to make sure they would be able to survive hibernation. The spring tours from the lodge would find these bears on the beach turning over rocks for protein as well as eating sedge grass. In the summer they still appear on the beach at low tides but substitute berries for the sedge grass. And of course in by late August they are on the river enjoying the abundance of pink salmon returning to spawn in the Glendale River. The tour schedule from Grizzly Bear Lodge follows the bears as they change their feeding habits viewing first from the water in the estuary to the viewing stands at the spawning channel.